Jeff Murphy is President and CEO of ECT Services, Inc., a building technology firm which provides the integration of climate control, security, intrusion, fire, intercom and active shooter detection systems for commercial buildings. The company’s focus is to increase revenue and decrease costs for Customers by making buildings sustainable, maintainable, energy efficient and safe through design, development, installation, integration, and service. Murphy brings a unique combination of technical and business knowledge expertise as a strategic, competitive, dynamic leader and speaker. He is extremely Customer, and Team Member focused and provides tremendous energy to solving business problems. He has enjoyed over thirty (30) years of experience in leadership, sales, process control, building controls, and security systems related to industry markets such as K-12, Higher Education, Manufacturing, Healthcare, Logistics, Industrial, and Government. Scott Cochrane of Cochrane Supply & Engineering has the unique benefit of working with 300+ of the best systems integrators in the country. Cochrane recognizes the critical role they have within the building automation industry and is speaking with a different highly-regarded MSI each month with the goal of providing examples of industry trends, best business practices, and the growing value of an MSI. This month, he interviews Jeff Murphy, President and CEO, ECT Services, Inc.
January Interview with Chris Saltz, Managing Principal of FIX Consulting LLC. This month he interviews Jeff Murphy. President and CEO of ECT Services, Inc.
Murphy: So how we started was really years ago, back in the early 80’s, focusing on a small system that would monitor energy usage in buildings. All it did was monitor and provide alarms and within the next decade that grew into temperature control systems. As we got into temperature control systems, our customers were asking us to integrate other technologies that we were using such as lighting, security, intrusion, fire, etc. 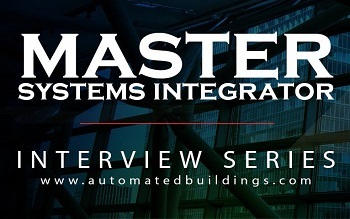 So we essentially migrated into the integration business, and over the years, as we got more involved with various pieces of building automation, it became very clear that we needed to get these pieces to work together. Murphy: Some of the key qualifications are certifications in the networking side of things because you have to understand how things communicating across everything is moving to the internet. You have to have a solid certifications background and knowledge base. There has to be a strong base on the platforms such as Tridium and the various systems that you may support. For us, that’s Alerton, Distech, and Siemens, and then on the security side, we deal with Lenel, Genetec, and others. So there has to be a strong certification and knowledge base associated with those systems. You have to have people that think outside of the box. For example, we are actually using a security output to turn off a college football scoreboard. It’s an unusual use for a security system, but it has a built-in timer—so you have to be able to think outside of the box to execute some unusual applications. Murphy: I don’t know that we go and sell it with that language… what we do is help our customers design what they need. We step back and talk about how they’re going to use their building. Ideally, what you want to do with your building. How do you want lights to work? How do you want the doors to work? What areas do you want to be closed off? What areas do you want to be open for public access? How are you going to use your energy management systems and what kind of energy management systems are they? So really, it starts with understanding what that customer really wants and then from there, we really make sure that their initial design desires are met through the integration that we do. Cochrane: How do your customers procure MSI services? What’s the structure of the contract you’re in? Murphy: It varies across the map again. Ideally, we would sit down with them and talk about their design of what they want in their building and how they want that building to perform. Then we would draw out contracts for specific projects. It may be a security project; it may be a security tied to HVAC project; it may be a facility management project that would encompass several different pieces of technology. At that point, it would certainly be an ongoing service agreement to support those technologies that would also include changes and upgrades and additions as they continue to grow their building and migrate it to the next generation of technologies. Consultation: 30%. We spend a fair amount of time talking to our clients. Murphy: One challenge is getting the customers to see us as the upfront design help. That’s when we are the most successful; that’s when our customers are happiest—rather than the traditional engineering world where we put together a specification. Typically, customers don’t get what they want under that scenario. We need them to see us as that design side. The second challenge is that there are few standards in certain aspects of these systems. For example, the security world does not have very many standard protocols and so getting different systems to work together can be challenging. It’s challenging to try to come up with ways to get a system that was put together five years ago to communicate with something we are putting in now just because there are no standards on that side of the business. The HVAC world has way better standard developments. The third challenge is finding people and resources that have experience and understand and want to be involved in this, and again, finding them to have the right kind of qualifications and experience. Finally, there is the challenge to get certain things to be able to communicate since IT Departments are so protective. Oftentimes they say no before they really understand how this device could be secured and how the device could help the business and the building owner. I mean this with all due respect because IT leaders have a lot on their plate, mostly the security of their systems. But they have this mindset of don’t add anything to our network, just out of the fear for lack of security rather than how we can deal with it. Murphy: Absolutely! The products are becoming more and more the same regardless of brand. So most customers don’t care what the brand of the product is per say, but they want to make sure that it will work with their iPhone or their Android device, and they want them all communicating together so that I can access them remotely and locally. And the data is shared between those systems, and that’s only going to continue. And with the IoT, things that we never thought would be electric and digital are going to start heading that way. We are actually working on a project right now where a desk has a sensor on it, and the sensor determines whether that person is there or not so that they know they are getting utilization out of that space. Everything is becoming a digital point, and it’s just going to continue to grow the need for integrating those things together.